The Internet is a distributed system of interconnected computers throughout the world. Each computer as an address, know as an IP Address, but mostly humans want something more memorable—that’s where domains come in. Domains, like google.com or algonquindesign.ca, are just for humans so we can more easily remember where a website is. But computers don’t necessarily care about domains, they care about IP address, which are the actual locations/names of the computers connected to The Internet. Every single computer connected to the Internet has a unique IP address. An IP address looks something like this: 192.168.1.0 or 2001:0db8:85a3:0000:0000:8a2e:0370:7334—which aren’t terribly memorable for regular mortals. Whereas, domains like github.com are much more memorable. So the purpose of the Domain Name System (DNS) is to map domains to IP address and provide other information about a website. There’s a direct connection between a domain and it’s associated IP address. 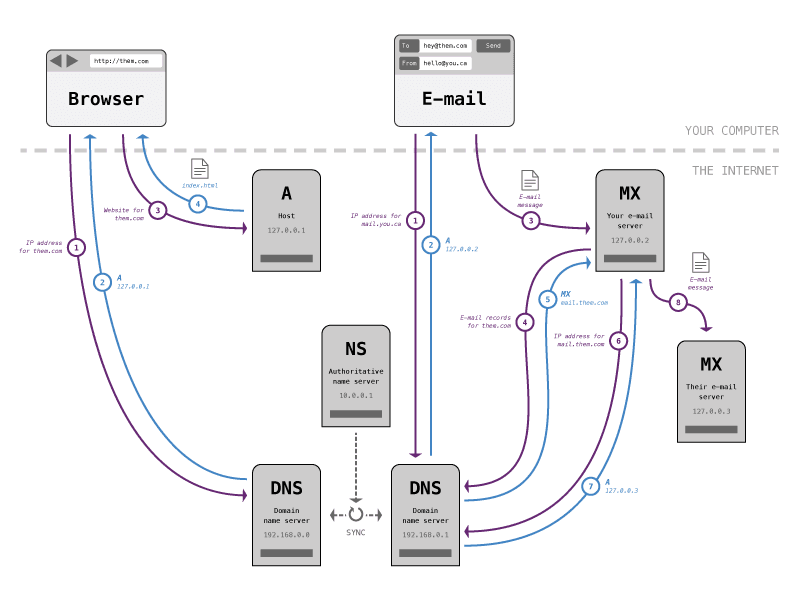 Your computer connects to a DNS server, requesting DNS information for the domain you typed in. Your computer already knows the IP address to at least one DNS server because your Internet provider sent it to your computer. The DNS will then send back the IP address of the computer that hosts the website to your computer, if it knows it. If it doesn’t know the IP address it will send your computer the IP address of another name server that might know. The loop continues until your computer has the IP address of the host. IP address of the website host is called the A record. When your computer gets the IP address it connects directly to the host computer and requests to see the website. The NS records in your DNS information points to the primary name server for your domain—usually your registrar. All the domain servers synchronize with each other so it can take time for your domain records to show up on all the DNS servers around the world. If the DNS server your browser requests doesn’t know the IP for the domain you want, or if that information has expired, your computer will most likely connect to the authoritative name server for your domain to get the real, fresh DNS information. The process for sending e-mails is similar to viewing a website but requires more requests and more DNS records. The DNS records for e-mail servers are called the MX records. Your computer connects to a DNS to find the A record for your mail server. The DNS sends back the IP for your e-mail server. Your computer connects to your e-mail server using the new IP and submits a new message. Your e-mail server then connects to the DNS to find the MX record for the domain of the person you’re sending your message to. The MX record is sent back to your computer. If the MX record isn’t an IP address a whole new DNS lookup must happen for the A record of the other mail server. The DNS will then send back the IP address of the other person’s e-mail server. Your e-mail server connects to the other person’s e-mail server and posts the new message on it. More control over your domain settings, e-mail addresses, etc. Easier to move hosts—because you will want to at some point. If you transfer your host, then you don’t also have to transfer your e-mails—and you won’t lose any messages. And you don’t have to transfer your domain, just point it to a new host. If you have hosting related problems, you may also have e-mail related problems if they’re in the same location. Security: if your hosting account is hacked, then so is your domain registrar and the hacker can just transfer your domain somewhere else. It’s not always clear who owns the domain when registering it with a host. The only real downside of separating domains and hosting is a slight loss in convenience. The first step in the whole process is buying a domain. I usually buy my domains from Hover. Though we generally call it “buying” a domain you aren’t technically buying it, but leasing it for a certain amount of time, usually a year. And every year you have to pay for it again. ☛ Follow the Hover setup lesson. There are lots of different e-mail providers and hosts often provide e-mail exchange also. But it’s best to purchase your e-mail from another provider. I often buy my e-mail services from FastMail†. ☛ Follow the FastMail setup lesson. Using GitHub as a static web host is simple, integrates with our processes—and it’s free. ☛ Follow the hosting lesson. † The FastMail links are referral links, from me, that will get you 10% off your first year. Here a few extra resources, activities, lessons & coding exercises to explore that’ll help you practice this new knowledge. Explore with the weekly curriculum that demonstrates this material. Get a quick review of the material with these slide decks. Follow along, coding a full example, with these step-by-step lessons. See if you’re knowledge is perfect by doing these activities & quizzes.